Watch the Sales Cloud Einstein demo. 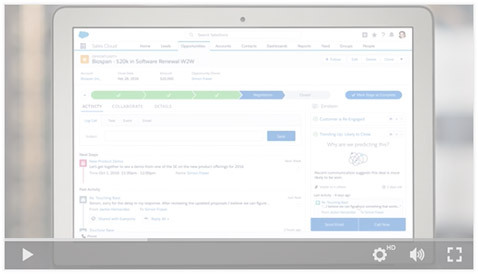 See how you can sell smarter with the all‑new Sales Cloud Einstein. Lead Scoring — Always start with your hottest leads. Activity Capture — Bypass data entry to save serious time. Opportunity Insights — Find the next best steps to close. Account Insights — Stay informed and build richer relationships. Fill out the form to the right to watch the demo today.